This article is about the basketball player. For the fictional character, see Nate Archibald (Gossip Girl). Nathaniel "Tiny" Archibald (born September 2, 1948) is an American retired professional basketball player. He spent 14 years playing in the NBA, most notably with the Cincinnati Royals, Kansas City–Omaha Kings and Boston Celtics. In 1991, he was enshrined in the Naismith Memorial Basketball Hall of Fame. Archibald was a willing passer and an adequate shooter from midrange. However, it was his quickness and speed and shiftiness that made him difficult to guard in the open court, as he would regularly drive past defenders on his way to the basket. Archibald, a playground legend while growing up in a rough-and-tumble neighborhood in the South Bronx, of New York City, played high school basketball for only one-and-a-half seasons, and was cut from the varsity squad at DeWitt Clinton High School as a sophomore. He returned to the team as a junior. During his time without basketball, Archibald briefly flirted with dropping out of school after having been largely truant in past years. But with the help of two mentors, Floyd Layne and Pablo Robertson, Archibald turned it around. Robertson, a former standout at Loyola of Chicago and a Harlem, New York playground impresario, had seen the gifted, mercurial Archibald in action on the playgrounds and convinced the young man's high school coach to re-instate him on the squad. Despite playing only in blowouts as a junior, the shy, quiet teen managed to blossom into a high-school star, being named team captain and an All-City selection in 1966. Off the court, Archibald began to attend school regularly and worked to improve his poor academic standing, which deterred most colleges from offering him a scholarship. To improve his chances of playing major college basketball, Archibald enrolled at Arizona Western College, transferring to the University of Texas at El Paso (UTEP) the following year. He had three standout seasons at El Paso, from 1967 to 1970 under Hall of Fame coach Don Haskins. Archibald was selected in the second round of the 1970 NBA draft (19th pick) by the Cincinnati Royals. He was also drafted by the Texas Chaparrals of the American Basketball Association. In 1972–73 season, Archibald led the NBA in scoring and assists, becoming the only player to win the titles in both categories in the same season. (In the 1967–68 season, Oscar Robertson led the NBA in points and assists per game but did not win the titles because they were based on totals rather than averages at the time.) His scoring average of 34.0 points per game broke the NBA record for a guard. His 910 assists that season (11.4 assists per game) was also an NBA record at the time, breaking Guy Rodgers' mark of 908. He was named the Sporting News NBA MVP that season. Archibald played for the Kansas City Kings from 1970 to 1976. 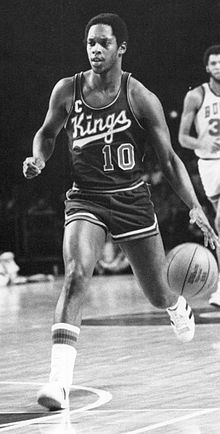 Although he was the Kings' most popular player, he was traded to the New York Nets for two draft picks and two players in 1976. Injured for much of the 1976–77 season, he was traded by the Nets to the Buffalo Braves before the 1977–78 season. Archibald tore his achilles tendon and never played a regular-season game for the Braves. Buffalo traded him to the Boston Celtics as part of a 7-player deal before the start of the next season. His career at the Celtics started poorly. He showed up 20 pounds overweight. However, he adjusted and helped guide the Celtics to the best record in the NBA for three consecutive years (1979–1982). Archibald won his first and only NBA championship with the Boston Celtics in the 1980–81 season alongside young NBA star Larry Bird. Archibald was an All-NBA First Team selection three times (1973, 1975, 1976) and an All-NBA Second Team selection two times (1972, 1981). A seven-time NBA All-Star Game selection (1973, 1974, 1975, 1976, 1980, 1981, and 1982), he was named the 1981 NBA All-Star Game MVP. Archibald led the NBA in free throws made three times and free throw attempts twice. He competed in 876 professional games, scored 16,841 points (18.8 points per game), and dished out 6,476 assists. He was named to the NBA's 50th Anniversary All-Time team. Nate Archibald was inducted to the Naismith Basketball Hall of Fame in 1991. He completed his bachelor's degree from University of Texas-El Paso by going back for three consecutive summers just prior to finishing his NBA career. He then taught in the New York City school system and attended night school at Fordham University. He received a master's degree from Fordham University in 1990 and a professional diploma in supervision and administration in 1994. He began long-distance correspondence work toward a doctorate from California Coast University in 2000 but ceased his studies because of "his lack of funds and the motivation to complete a long-distance correspondence curriculum." He has stated his hope to complete the degree in the future at Fordham. Archibald was an assistant coach, spending one season in the University of Georgia and two with Texas-El Paso (where he worked with Tim Hardaway). He has also coached the New Jersey Jammers of the USBL and in a Boston recreational league. Archibald coached in the National Basketball Development League in 2001. He resigned a year later to take a position with the NBA's community relations department. Archibald was also named the head coach for the Long Beach Jam in 2004 in the revived ABA, but he would ultimately resign from his position on January 17, 2005 during their second and final season in the ABA. ^ Herzog, Bob; and Barker, Barbara. "Ewing, Five Former Knicks Among NBA's 50 Greatest", Newsday, October 30, 1996. Accessed September 14, 2009. "Three former Nets, Julius Erving (Roosevelt High), Rick Barry (Roselle Park, N.J., High) and Nate Archibald (DeWitt Clinton), also were selected"
^ a b "NBA.com: Nate Archibald". Retrieved May 20, 2008. ^ The Official NBA Encyclopedia. Doubleday, 2000. 277–280. ^ "Knowledge Is Power For Tiny Archibald". www.fanhouse.com. Retrieved September 23, 2010. This page was last edited on 5 April 2019, at 19:27 (UTC).